Banking IT systems are too complex, and the bigger the bank, the more likely it is that this bank will fail to succeed. These were the key findings from research released by Gartner last month. The analyst house identified the increasing size and complexity of banks as a key factor in banks’ inability to effectively support and manage IT operations – let alone capacity to upgrade IT systems and cultivate innovation. These findings come at a time of flux in the financial services industry: traditional banks are struggling against a backdrop of reduced IT budgets, increases in resource-consuming regulatory changes and significant pressure from the emergence of new financial services players. Add to this hotpot of change growing consumer demands for innovative and digital banking services, and the result is an environment of intense pressure on traditional banks – and an ever-greater spotlight on the complex IT systems they operate on. More than ever, banks are under pressure to adapt their business and IT models to fit in to this changing business environment. The introduction of innovative banking products would answer the consumer demands for digital offerings, while upgraded IT systems would better adapt to new regulatory demands, and would be less likely to suffer from system outages, ultimately saving banks money. Banking IT problems not only disrupt services, but also cost great amounts to rectify. At a time of reduced budgets across the banking community, it is difficult to justify these extra costs. Which all combines to beg the question – why aren’t banks shedding their antiquated enterprise systems or simplifying their IT landscape? Ultimately the answer to this can be broken down into two key areas: cost and risk. According to analyst house Ovum, in 2013 retail banks across the globe will see IT spending grow 3.4 percent, reaching US$118.6bn – an eye-watering sum of money. All banking players face the same challenges: obsolete software, complex IT landscape and a limited choice of ‘off the shelf’ software. One of the greatest cost hurdles facing banks looking to upgrade their IT systems is integration. In large organisations, such as the large banks Gartner identifies as being ‘too big to succeed’, integration costs can make or break the business case in the deployment of new applications and packages. At often triple the original purchase price of the software, integration costs are prohibitive to banks upgrading or replacing legacy IT systems. The risk element is also substantial. Core system renewal is often seen as an operation akin to open heart surgery for banks. The cost and risk associated with the introduction of new IT elements are determined by the degree of standardisation of interfaces from a technical and a definition point of view – in the current absence of industry-wide standards for banking IT services, core system renewals cost huge amounts of money, time and effort, representing a risky and expensive undertaking. Recent statistics from Intellect illustrate the negative impact such restraints are having on banking innovation. 80% of banks’ IT budgets are currently being spent on maintaining their legacy systems, ‘running the bank’, with the other 20% going towards new projects. However, 80% of this 20% is spent on reactive obligatory regulatory compliance projects, meaning that only 4% of the total IT budget is being spent on innovative non-regulatory change. Imagine a world where integration costs and volatile legacy systems are a thing of the past. If the banking industry can join forces, with one another but also with IT software providers, to define industry-wide standards for banking IT services, integration costs would be significantly reduced. This would greatly improve the business case for system upgrades. What’s more, improved interoperability would promote the re-use of existing software elements. Does every single piece of banking IT need to be unique? The answer is no. Many banks are already adopting standard packages and are retaining their competitive position by implementing their own unique elements alongside these IT packages. It is increasingly clear that service oriented architecture (SOA) is the best IT framework for internal and external interfaces, as the resulting landscape will be one that connects IT operations to business functions and objectives. 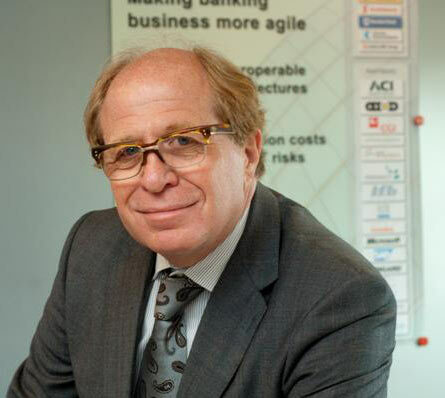 Institutions that come into line with this standardised IT architecture will not only reap the financial benefits of reduced integration costs, but will also be pioneers of a new banking IT model which encourages flexibility and innovation. At a time when new financial players are entering the market, banks which can adapt to the market and move fast enough to withstand the innovations of their competitors will have the leading edge. Proprietary technology was once seen as a competitive advantage. Today, more often than not, it’s actually weighing banks down. The financial services industry is just coming out of the largest financial crisis of the past 80 years. One consequence of this is the decline of IT budgets – where in the past banking technology budgets were seemingly unlimited, business colleagues are now demanding more value for their money. Combine this new bargain-hunt mentality with a greater-than-ever need for agility and innovation, and it’s no wonder that banks are beginning to look for alternatives. Collaboration on the creation and adoption of standards for banking IT services will change the industry for the better by generating greater efficiency and lowering integration costs, which will encourage innovation and flexibility. Now is absolutely the right time for financial industry and IT vendors to work together on IT standards. In my view, cross industry collaboration and standardisation is the only way forward.